It's time once again for the cottage cooking club to come together and posts our thoughts and experiences for the month. We are a group of international bloggers bound together by our love of fresh seasonal and sustainable recipes from Hugh Fearnley-Whittingstall's cookbooks. Last month we completed two years of cooking along with "River Cottage Veg" and will begin our official start-up in July with the, "River Cottage Every Day" cookbook. Andrea of the Kitchen Lioness is our wonderful leader and organizer. Each month she will pick one recipe from each of the 10 chapters and then we will choose as many as we have time for. However this month will be different. Today is Food Revolution Day, an initiative of the Jamie Oliver Foundation. The Food Revolution is a global campaign to improve the health and welfare of children through the food they eat. Part of this process is educating people to make healthier food choices, the more understanding the better choices they will make. 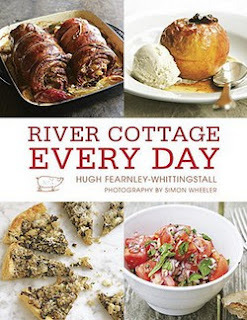 Since Andrea is part of the Food Revolution Community, we will be joining them by choosing recipes from "River Cottage Every Day", (our new book) that we individually feel is a must-know recipe. In turn we will share the technique and cooking skill we learned from it. Our motto for the month of May is Join the food revolution! The first recipe I prepared was the Seedy Spinach Salad. This was quick to prepare and utterly delicious. First the seeds are pan roasted. I used four kinds of seeds; pumpkin, sesame, poppy and fennel. Then a simple dressing of lemon, olive oil and salt is made. The object of this recipe is to have the seeds stick to the spinach leaves and not all fall to the bottom of the dish. The trick is to first pour half of the dressing on the greens; lightly toss then add half the seeds, then add the rest of the dressing and then the last of the seeds, toss once again. My picture does not do this salad justice, it really is pretty. In this recipe you see that by using seeds or even nuts you can create a satisfying and healthy meal. I need to be more resourceful with the ingredients I have in my pantry. The second dish I prepared was the Tartiflette toastie, which is a great way to use up leftovers. I prepared Hugh’s meals on toast from the first book with great results and this one was no different. Here bacon slices or ham, cold baked or boiled potato, cream, a slice of cheese and toasted bread are placed in a hot broiler. The cheese will melt and start to bubble, a sure indication of a comforting hot meal. There are so many different ways to prepare this dish, the combinations are endless. Most of us have leftovers. All you need is some kind of vehicle for the ingredients to land on, pizza, pita, English muffins, etc. No need for fast food when you can create satisfying meals like this in your own home. The third and last dish I prepared was the Asparagus soldiers with a soft boiled egg hollandaise. We all know how wonderful asparagus and eggs taste together but in this recipe the addition of a little butter and cider vinegar can ratchet up the yolks to a creamy almost hollandaise like deliciousness. This was a quick and effortless technique with loads of flavor. These recipes have been slightly adapted from the "River Cottage Every Day" by Hugh Fearnley-Whittingstall. First recipe; from the chapter "Vegetables Galore” Seedy spinach salad (page 293). 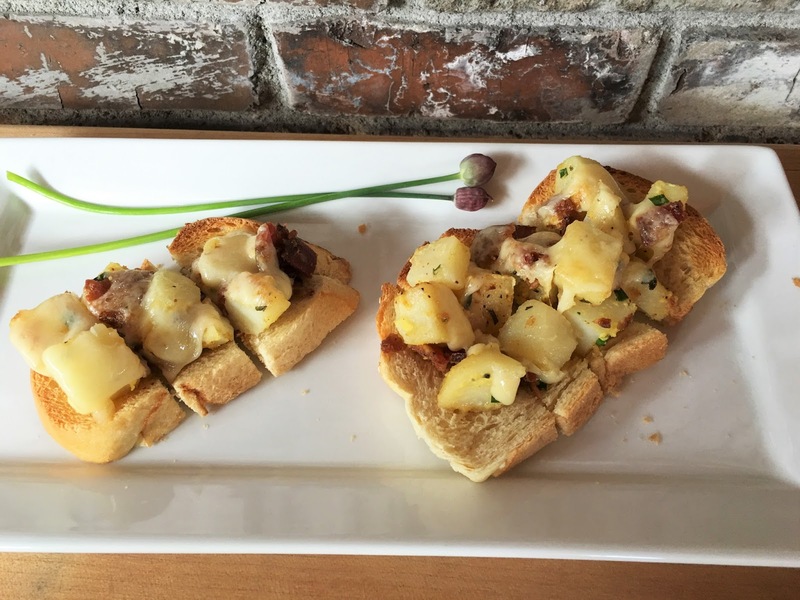 Second dish from the chapter "Weekday Lunch (Box)” Tartiflette toastie (page 114). Third recipe; from the chapter “Vegetables Galore” Asparagus soldiers with soft-boiled egg hollandaise (page 254). To see what recipes the other members chose for this month, head over to the LYL post for May 2016 on the CCC website, by clicking here. P.S. Back in Oregon will send out a update in a couple of days. Your group cooked up some wonderful dishes from his last book, I can't wait to see what lies ahead. Thanks Karen, we have had a great time and met some lovely people. 3 lovely recipes--and a terrific message to be mindful of what's in the fridge and pantry! Have a terrific weekend!! Thanks Liz, we are in Oregon now and the weather has been wonderful, take care. I can already taste the deliciousness this event is going to serve, Cheri. Your choices are just perfect!!! Thanks Louise, we enjoyed everything. Thanks Tandy, I enjoyed it as well, simply but delicious. I am really interested in the vinegar technique with the eggs. Sometimes it is the simple recipes that are the best. Thanks for sure, thank Bobbi for stopping by. Great tips on the salad Cheri. Your salad must have been exquisite because the spinach, 4 seeds and dressing look pretty great in the photo. Bravo too for joining the Revolution 😉 Your eggs always look perfect and yummy! Thanks Kim, that was a hard photo to shoot. Hope you are having a great week-end. Thanks Dena, I think he is a charismatic and caring person and is making a difference. 3 wonderful recipes! That salad looks particularly great to me, Cheri. Thanks Angie, sometimes simple is best. I'm waiting for more! Great dishes! Those were wonderful recipes to choose - I especially loved the tartiflette when I made it. And I loved your reasons for choosing them - resourcefulness in the pantry, using up leftovers, and learning how to boost flavour are important lessons that River Cottage Veg provides. Thanks Teresa, River Cottage cookbooks are perfect for everyday cooking. Yes we are back, working feverishly to get the yard and house back in order. All three recipes sound great. I love both of those cookbooks! Thanks Beth, you can't go wrong with Hugh's recipes. These posts are always so interesting and tempting. It's clear to see that healthier food choices often mean really, really delicious food! Thanks Monica, it's really all Hugh's recipes. Most of them are simple and delicious. 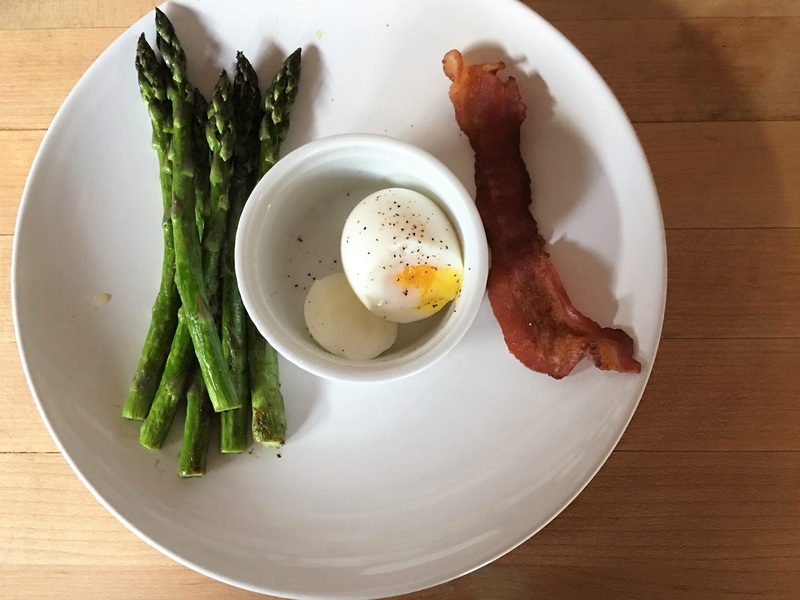 Love all of these dishes, especially the asparagus with poached egg. My kind of breakfast! Thanks Gaye, I have been on a breakfast kick lately. That tartiflette toastie sounds brilliant! A great variety of recipes. What fun! Love those toasted seeds in the salad...definitely going to try that. Thanks Barbara, yes, that salad was really good, I have never had a salad quite like that before. Wow, you are busy in your kitchen, Cheri! I love all these recipes and of course, I love asparagus and eggs together! The seed salad is so interesting. I will definitely try this because I've always got so many different types in my pantry. Great healthy snack! Hope you're settle in and enjoying some good weather! Hi Robyn, no not quite yet settled but we are working on it. Trying to de-mole the garden with extra perimeters. All the dishes look fantastic! Love the asparagus and salad! So fresh and delicious! Thanks Kelly, love the veggies this time of year. I think you chose some good food for the soul! I'll bet you are happy to be back in Oregon! Yes, it feels good to be back, trying to get the garden back up and running. Hi Cheri! Hope all is well and your travels to Oregon were smooth! I've been enjoying the Food Revolution columns among the CCC group though I was pressed on time for commenting over the weekend. Love that Spinach Salad and the other two dishes look and sound lovely too. See you soon! Thanks Peggy, I know time seems to be flying by, but I suppose that means life is good.Take care. You made some great dishes! Those asparagus soldiers looks particularly nice. Cider vinegar? Interesting! Fun post -- thanks. Those are 3 great recipes Cheri. I made the spinach salad this month also and was amazed by how the addition of some seeds could transform such a simple recipe...but that's what Hugh does best! Dear Cheri, thank you very much for participating in the Food Revolution Day 2016 along with our lovely Cottage Cooking Club! I am so very proud of all of you! I finally managed to put my post together and link it today! You cooked three delightful dishes and one looks better than the other! Big thanks and hugs from afar, dear friend!